The much avaited Xiaomi Mi band 2 is going to be launched on June 7th. 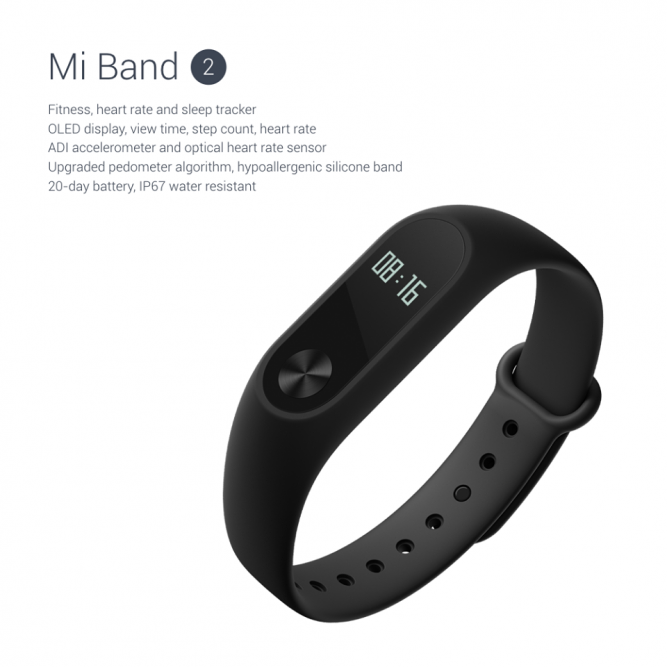 Unlike its predecessor models, Mi band 2 features a 0.42 inch OLED display, which will show time, step count, distance, heart rate, calories, power left and so on. You can view all these data by simply lifting your wrist or by using the capacitive button on the Mi band 2 capsule. You can also switch between various display items without having to open the Mi Fit App in your phone. The best part is, you can also customize which data information appears on the Mi band 2 display. In terms of function, Mi band 2 supports sports tracking, sleep monitoring, heart rate monitor, free password to unlock the phone, alarm reminder, sedentary reminder, call reminder and so on. Although Mi band 2 has an OLED display, its battery capacity improved a lot. It has a larger 70 mAh battery that will last up to 20 days. 55% more efficient battery life opposed to its predecessor. Meanwhile, Mi band 2 is IP67 water resistant and dust resistance. So, what’s the difference between Mi band 2 and Mi band 1/1S? Read the following detailed information. Mi band 2 is much longer, wider and thicker than its predecessor models. The one biggest change is Mi band 2 features a 0.42 inch OLED display, which will show time, step count, distance, heart rate, calories, power left and so on. You can view all these data by simply lifting your wrist or by using the capacitive button on the Mi Band 2 capsule. You can also switch between various display items without having to open the Mi Fit App in your phone. The best part is, you can also customize which data information appears on the Mi Band 2 display. The OLED is UV coated, scratch resistant and anti – fingerprint display. Display is elegant and bright enough and could see the display clearly under the sun light. Another change is that Mi band 2 comes with a larger, thicker and more comfortable strap. The material of the strap is softer and more skin friendly than its predecessor models. The new construction of strap makes the capsule fits into the strap firmly and cannot be easily detached from the strap anytime. Like its predecessor, the Mi Band 2 tracks basic movements, monitors your heart rate, measures sleep and so on. But one big difference is Mi band 2 upgraded pedometer algorithms for more accuracy in steps counting. And because of its OLED display, you can check your heart rate on real time without opening the Mi Fit App. Just simply lift your wrist or touch on the capacitive button on the Mi Band 2 display and your heart rate displays instantly on the screen. In addition, Mi band 2 added a new feature “sedentary reminder”. 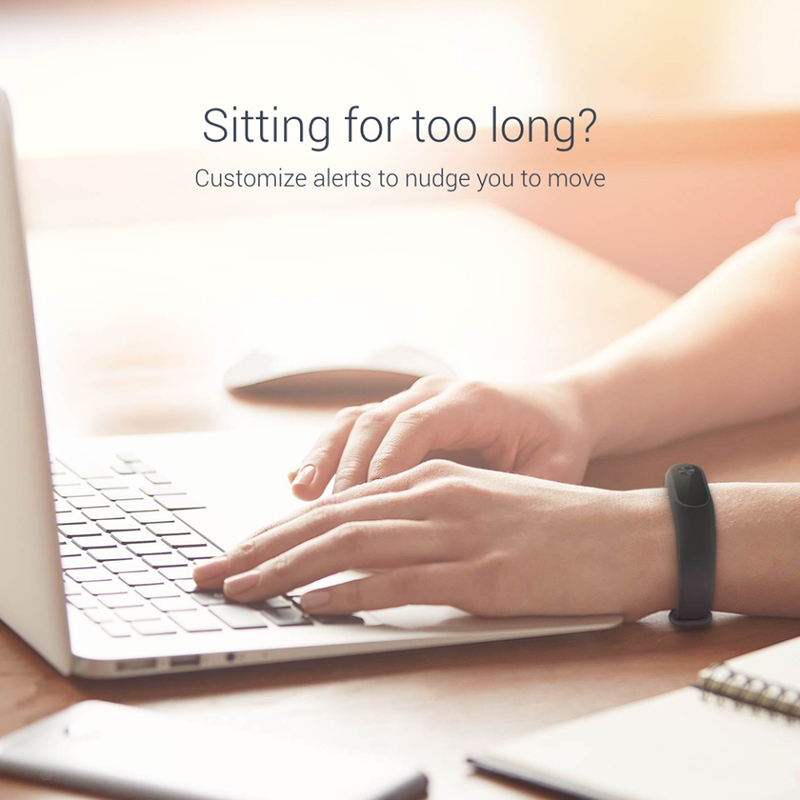 It will automatically monitors your physical activity and alerts you when you are sedentary for long time. It alerts you with a vibration reminding you to go out and have some physical activity along with some fresh air. 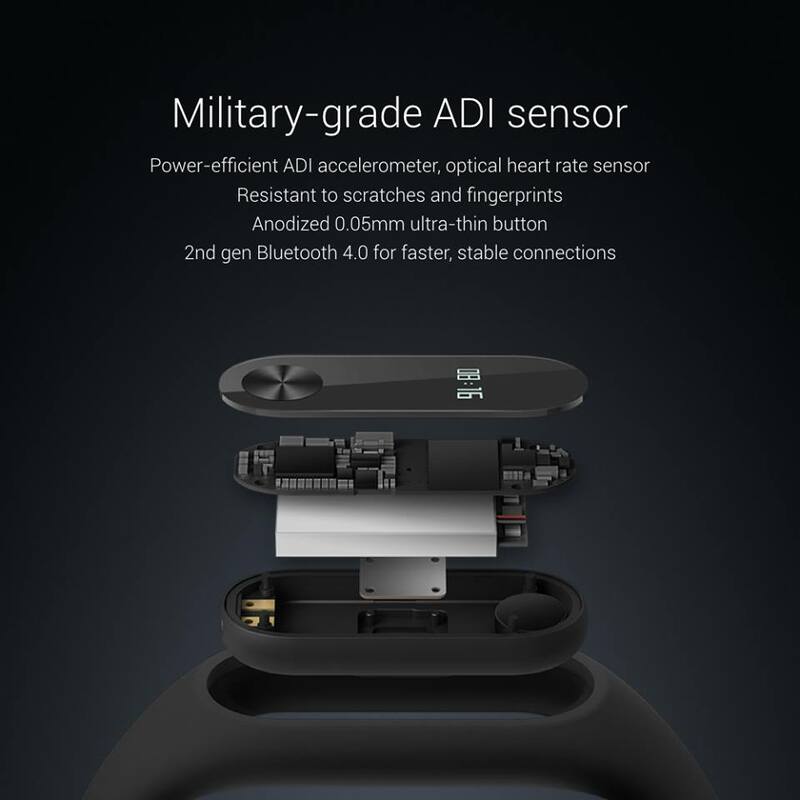 Unlike its predecessor, Mi band 2 comes with a power efficient ADI accelerometer with improved algorithms for more accuracy in steps counting, and built in optical heart rate sensor which calculates your heart rate. It comes with a 2nd gen Bluetooth 4.0 for faster and stable connection with your phone. The major concern in any fitness tracker is its battery life. We all know that Mi band and Mi band 1S have a 45mAh battery, while Mi Band 2 comes with a larger 70 mAh battery that will last up to 20 days. 55% more efficient battery life opposed to its predecessor. With an OLED display allows you to check time, step count, distance, heart rate, calories, power left etc.at anytime without having to open the Mi Fit App in your phone and a new feature “sedentary reminder” to ensure you won’t sitting too long plus 20 days long standby time, you probably won’t find a better value fitness band than the Mi band 2.